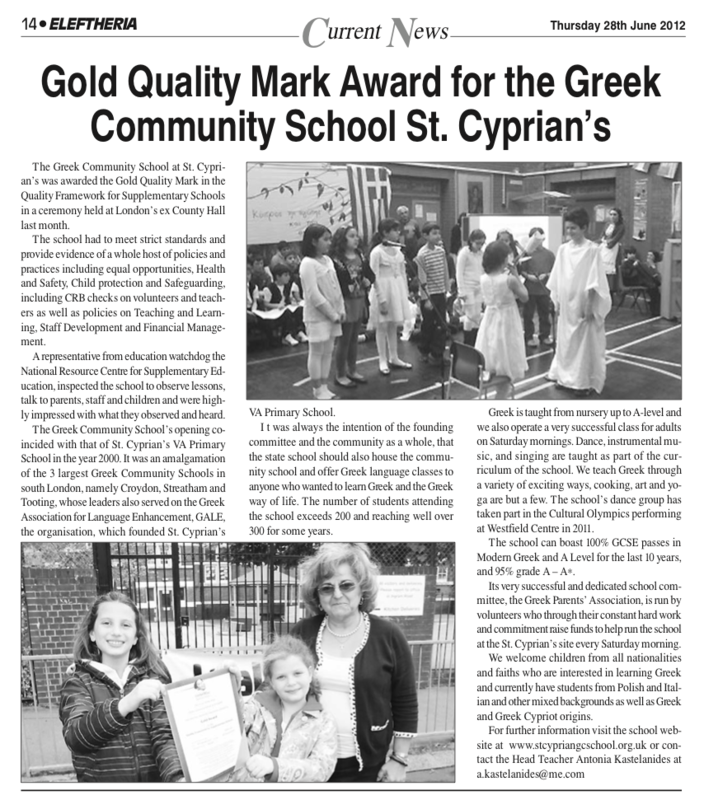 Our school, Greek Community School at St. Cyprian’s has been awarded the Gold Quality Mark by theNational Resource Centre for Supplementary Education and has become the first one of its kind in London to achieve that. From the year 2000 when our school was established, we can boast excellent examination results in both GCSE and A Level exams with a 100% pass rate in grades A-C.
We have sought to give our students the opportunity to gain certification in different exams including certification from Greece in their Greek Language learning. A measure of our school’s achievements and success must be that many of our students return to use the skills they have learned by volunteering, to “give back” in their words, to their school. Similarly ex students return with their own children, the next generation of the Greek diaspora maintaining and developing our Greek Heritage. Learning is always more effective if it is enjoyable.In our attempts to make learning a pleasurable activity for all our students we have learnt Greek through a variety of different activities. For example, our students have been motivated to learn through art, music, dance, cooking, sports, creating Greek board games and drama lessons too, as well as through visits to the British Museum and visits from the Museum of London to our school. Also through YOGA where the children not only exercise their bodies but also their minds and understanding of Greek through story telling in the YOGA class. We have encouraged our students in developing a social conscience and have collected food stuff and clothes and sent to Greece and Cyprus during the financial crisis as well as supporting individuals in need of medical assistance. As a school we have also supported a partner school in Kigese Africa, as well as inviting our elderly to join us at our Christmas concert and offering them hampers. 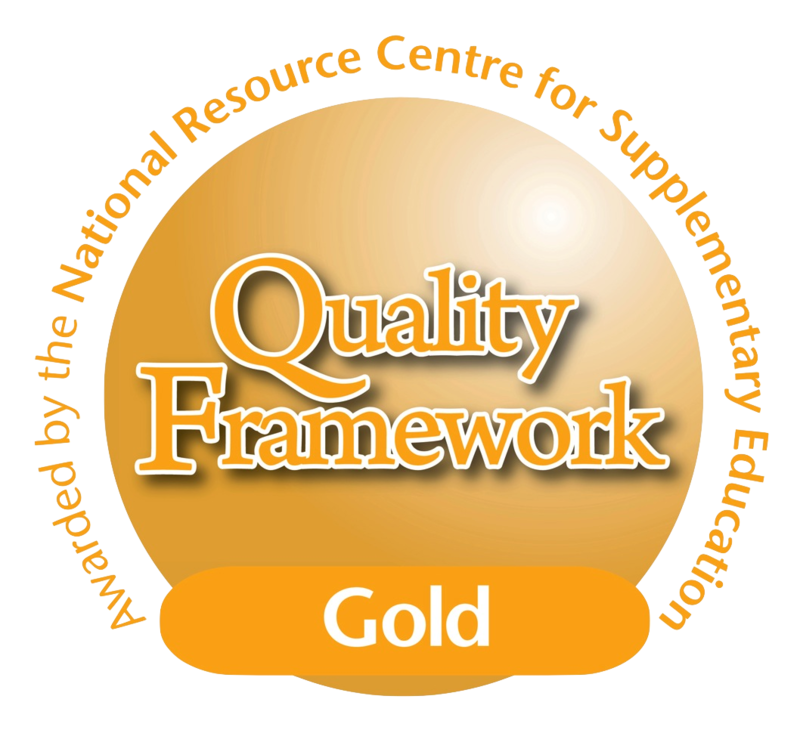 The National Resource Centre for Supplementary Education (NRCSE) is a national strategic and support organisation for community-led supplementary schools and the wider supplementary education sector across England. Established in 2006, they have became a registered charity (1150621) in 2013 and the national champion for excellence, innovation and partnership in supplementary education. Their campaign throughout England on behalf of supplementary schools and their students, tutors and leaders. They work with supplementary schools to raise their profile and their standards of teaching, learning and management. Our school is part of a wider Greek Community and our school choir and dance group have taken part in Community events to celebrate the Independence days of Greece and Cyprus, 25th March and 1st April, the Cyprus wine festival at Alexandra Palace, the 3 Holy Hierarchs and have also supported the Alkionides Charity organisation at fundraising events. Our dance group have also participated in various Festivals including the EKON Arts Festival at the Hellenic Centre. Some of our teachers and students participate every year in the decoration of the Easter ‘EPITAPHIO' at St. Nectarios Church in Battersea where we have also celebrated the feast of the 3 Holy Hierarchs with Father Christodoulos and the congregation. Working together to raise funds for our school will ensure its development and offer for future generations so please help us with whatever skills you have to help your children. Everyone is welcome. Speak to any committee member or the Head Teacher for further information.